The challenge for many MSPs is how to best sell business continuity solutions to the SMB market. In this whitepaper Datto presents six key takeaways to help MSPs; including, sell the value of business continuity (vs. traditional backup), maximize revenue from improved service, manage TCO to yield additional profit, it’s not beneficial to build your own device, and the benefits of partnering with an award-winning business continuity vendor who is 100% channel-focused. 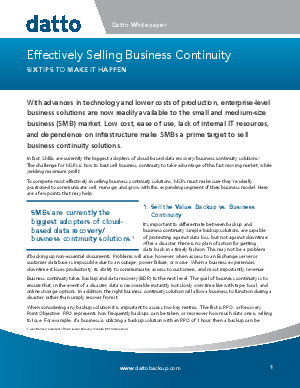 This is a great read for MSPs looking to get the most out of selling business continuity solutions.